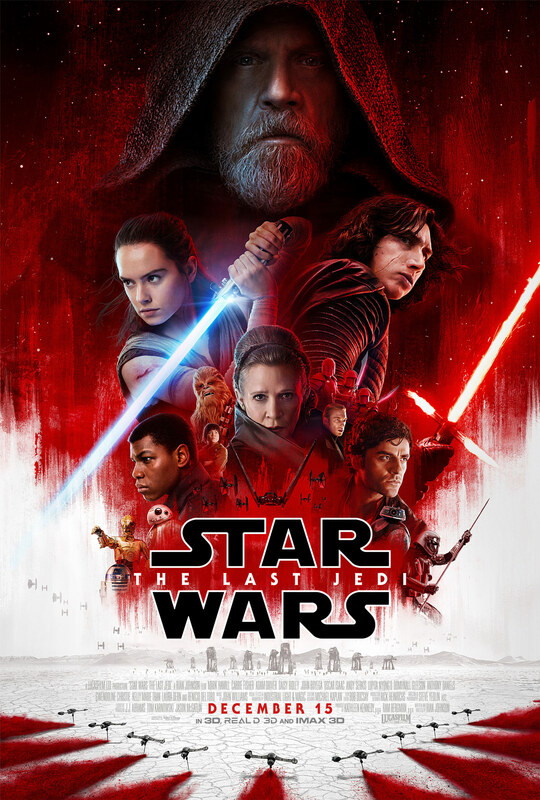 While Rey (Daisy Ridley) attempts to learn the way of the Force with Luke Skywalker (Mark Hamill), General Leia (Carrie Fisher) leads the Resistance as the First Order threatens them all. All the characters we met before in The Force Awakens (2015) have returned, plus some new ones. Two of the key new characters are Rose Tico (Kelly Marie Tran) who befriends Finn (John Boyega), and Vice Admiral Holdo (Laura Dern) who hotshot pilot Poe Dameron (Oscar Isaac) clashes with. A lot of the film focusses on Rey’s training as she learns more about the Force and what made Kylo Ren (Adam Driver) turn to the Dark Side. Rey and Kylo are often portrayed as equals or two sides of the same coin and their interactions are often tense and fascinating. These two are the main focus of the film, which then means characters like Finn are side-lined which is unfortunate. To be honest, the Finn and Rose’s whole plot could’ve been much more condensed so they get back to the main group of heroes sooner. That being said, all of the cast give excellent performances and Hamill and Fisher add so much more to their iconic characters. The Last Jedi is an action-packed sequel with a lot of humour, some of which doesn’t always hit the mark. There’s a lot going on in this film with characters splitting off and going on their own missions, but at the same time, all of this stuff doesn’t do much in terms of progressing the overarching plot. This film seems to focus more of character development, which is not a bad thing at all, though it is sometimes heavy handed and by focusing on this there doesn’t seem to be any form of resolution in the battle of good vs evil. Naturally this is the second film in a trilogy, so there’s time for things to be resolved in a satisfactory way. The action is well shot, and the blend of CGI and practical affect is once again to the highest quality. The Last Jedi is also a good-looking film, with some stunning locations and interesting new worlds and creatures to meet. The Last Jedi combines the family fun with dark themes, to varied affect. Sometimes these opposites are too extreme while in other cases it allows for a moments rest before these characters we know and love are in peril once more. There’s a lot of twists and turns in The Last Jedi, taking the franchise to places it may not have gone to before and it’s an unsettling thing. This makes The Last Jedi a fun ride but it’s not a flawless one. 3/5. *Side note* I will be seeing this film again next week so I’m interested to see what I make of it after I’ve had time to think about it – will the flaws be more noticeable, or will I find more things I like? Who knows?